A Dutch student has reveal the prototype ambulance drone. A flying defibrillator able to reach heart attack victims within precious lifesaving minutes. Developed by engineering graduate Alec Momont. It can fly at speed up to 100 kilometers/hour. It will gives emergency services driven by six propellers. It can carry a four kilogram load. Around hundred thousand peoples suffer a cardiac arrest in the European Union and only 8% survive. The main reason for this is the relatively long response time of emergency services of around ten minutes. While brain death occurs in these cases from 4 to 6 minutes. The ambulance can get defibrillator to the patient within a 12 square kilometer within a minute. Increasing the chance of survival from 8% to 80%. The prototype has already attracted the interest of emergency services. A Dutch daily said the Dutch heart foundation also appreciate the idea. The newspaper added Alec however wants his drone applying medical tool box which can carry oxygen mask to the people who are trapped in fire. However drone ambulance is in its initial stage. Alec trying to improve it and trying to resolve legal issue regarding this drone ambulance. 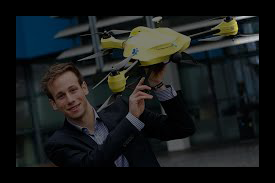 Alec hopes this drone start operational emergency within 5 years across the Netherlands. Drone expected cost is around 15 thousand euro. 19000 dollars each. I hope it will save 100 of lives in next 5 years.